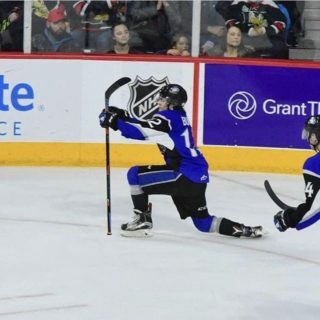 The Saint John Sea Dogs defeated the Quebec Remparts 4-3 in overtime on Wednesday night at Harbour Station. Saint John improves to 4-22-2-1 while Quebec drops to 13-11-3-3. The Sea Dogs young core took charge on the night with rookies combining for eight points. Quebec opened the scoring in the first period on a redirected shot from Mikael Robidoux at 6:01. The Remparts controlled the flow of the game for the first half of the period, but the Sea Dogs evened the energy down the stretch with the help of physical play coming from James White and Michael Campoli who contributed to Saint John’s five hits in the first. 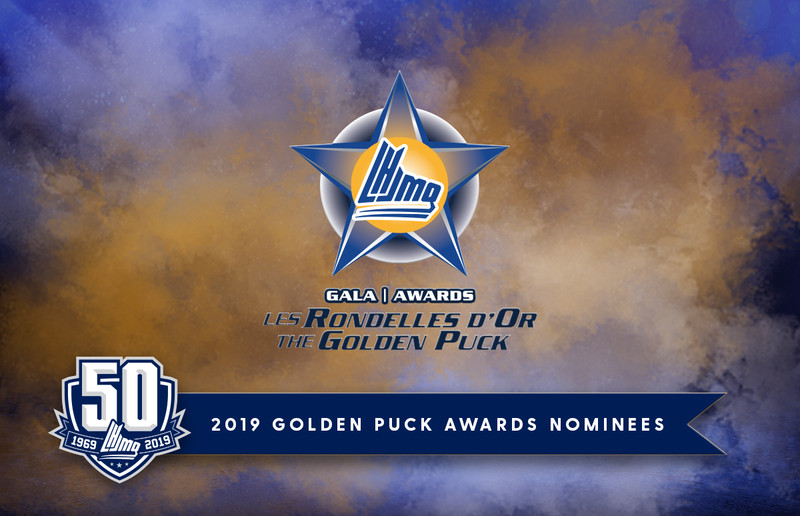 At 14:32 Charlie DesRoches watched his low point shot slip through the five hole of Remparts net minder Athony Morrone to tie the game. Charlie now has goals in four straight games and sits in sixth place for goals by a defenceman league wide with seven. Quebec took to the power play with under two minutes to go when William Poirier was called for holding but were held off the score sheet as the clock ticked down. Shots on goal favoured Quebec 11-7 in the first. Three minutes into the second period Brady Burns fed Maxim Cajkovic with a stretch pass for the break away and the Slovakian sniper made no mistake going low glove side past Morrone to put the Sea Dogs up 2-1. Mikhail Denisov was solid throughout the period for Saint John. staying in position and holding on to rebounds. After killing off a Nathan Larose holding penalty at 5:03 the Sea Dogs returned to the penalty kill later in the period when William Villeneuve was called for tripping. 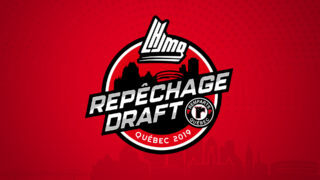 On the ensuing power play Remparts leading scorer Philipp Kurashev completed a cross crease one timer beating Denisov to tie the game at 2-2. The Sea Dogs took to the power play for the first time in the game at 18:49 but couldn’t get much going before the period came to an end. 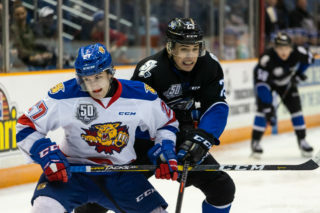 Quebec out shot Saint John 20-5 in the frame. At 3:14 of the third Matthew Grouchy added a power play marker when he snapped a shot off the post and in from the top of the circle to put Quebec in front 3-2. With the net empty and just over a minute to go in the game Jeremie Poirier took a tight angle shot from down low that found its way through a crowd to beat Morrone and tie the game. Denisov was brilliant down the stretch doing everything he could to keep the Dogs in it and send the game to overtime for the second time in three games. Shots in the third were led by Quebec 13-6. Overtime saw chances a plenty for both sides including an incredible move by Brady Burns as he stopped on a dime faking out the defender as he crossed the blue line before feeding Jeremie Poirier who ripped it off the post. Burns would get a second chance though, when a minute later he fed Robbie Burt in the slot who ripped home his second OT winner in three games. Sea Dogs win this one 4-3. 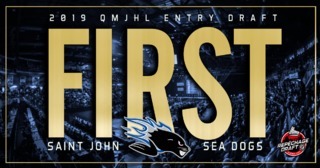 Mikhail Denisov was on a mission stopping 44 shots for the win, his first as a Sea Dog. Morrone had 19 saves for Quebec. A full scoring summary can be found here. 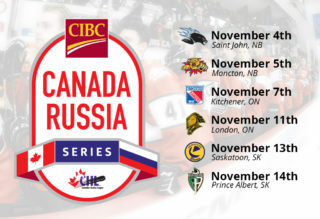 Saint John takes to the road where they’ll play Halifax on Friday and Moncton on Sunday afternoon before returning home next Wednesday to take on the Acadie-Bathurst Titan at 7PM.